Look at the camp of Israel, God’s holy people. 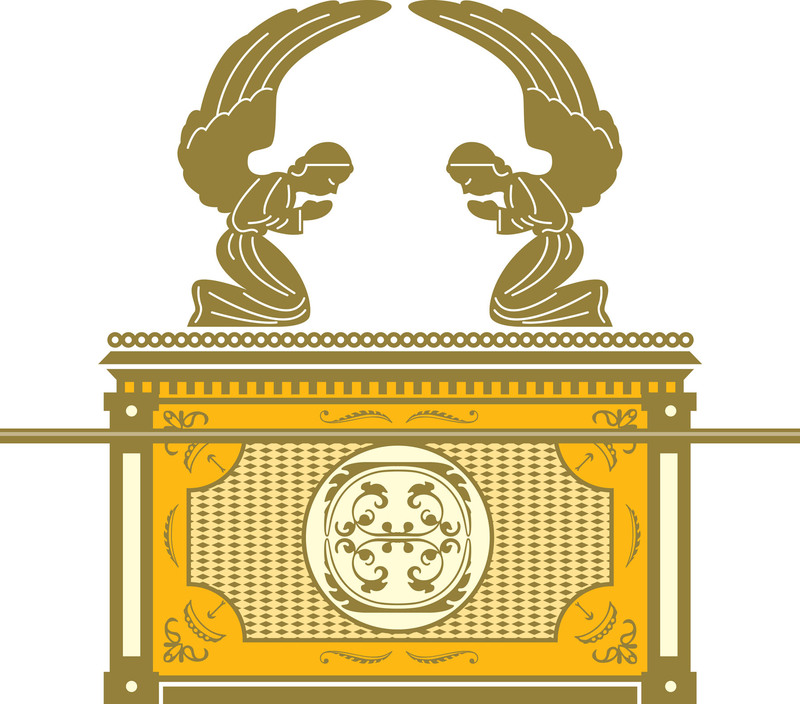 As you move from the border to the center, you encounter increased levels of holiness, until in the most holy place, is the ark of the covenant, described in Exodus 25:10-22. 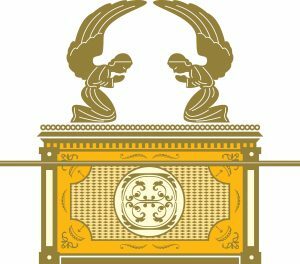 The ark of the covenant expresses the majestic holiness of God. Cherubim guarded the symbolic throne of God. The most holy place, unlike the temples of surrounding nations, contained no image of the god that was worshiped. It was not a place where the devotees could come into the presence of their deity. Rather, the most holy place was windowless and dark, entered only once a year by the high priest. The one piece of furniture in it was the ark of the covenant. This was a wooden box (roughly 45” by 27” by 27”) made of acacia wood, overlaid with gold, inside and out. It had a gold covered rectangular cover, called the atonement cover or mercy seat. On it were two cherubim, angelic beings that seem to have served as heavenly throne attendants for the Lord, see Genesis 3:24; Revelation 4, Psalm 80 and 99; also Isaiah 6. This cover was the symbolic throne of God, the place where he who dwells in the heavens came down to be in the midst of his covenant people. “Especially the presence of the ‘Kherubhim‘ [cherubim] upon the ark in the most holy place gives a majestic expression to the majesty-side of the divine holiness. These Kherubhim are throne attendants of God, not ‘angels’ in the specific sense of the word, for the angels go on errands and carry messages, whereas the Kherubhim cnno tleave the immediate neighborhood pf the throne, where they have to give expression to the royal majesty of Jehovah, both by their presence and and their unceasing praise (Isa. 6:3; Rev. 4:8, 9).” ( Geerhardus Vos, Biblical Theology, p. 167). The ark, together with the tabernacle and its other furnishings, was not a bare sign point forward to something better (though it certainly was that). Rather, it was also the place where God, mysteriously and sacramentally made connection with his people. Here is where he extended his grace and salvation to them. The ark contained the Testimony. The most important item to be placed in this box, this ark, was the Testimony, the tablets of stone containing the Ten Commandments. This was a written expression of the covenant God had established between himself and his people. Later a pot of manna and Aaron’s rod that blossomed were added as well. The atonement cover provided a point of access to God. A covenant is a relationship, but if there was a spatial focus, it was here in the ark. Here, at the mercy seat, atonement was made for sin. Here on the annual Day of Atonement, the sins of God’s people were covered over, or atoned for. “Accordingly the mercy seat is the place where the atonement is made. It is the place where punishment is carried out (represented by the substitutionary animal’s blood) and where cleansing occurs by means of the blood. God’s presence is above the mercy seat, and there he accepts the twofold atonement.” (G. K. Beale, A New Testament Biblical theology, p. 488). Sacrificial blood covered the sins of the priest and the people. Leviticus 16 describes the elaborate process. The high priest underwent ceremonial cleansing. He offered a sacrifice for his own sins, then one for the sins of the people. The blood of that sacrifice was carried in the most holy place by the high priest, and was sprinkled on the atonement cover. Every year that sacrifice was repeated. Through accepting that sacrifice God provided forgiveness for his people. They could continue to live as a people set apart to him, a holy people serving a holy God. You have a greater, a more perfect tabernacle. Christ is the mediator of a new covenant. Hebrews uses the word covenant more frequently than any other New Testament author. Not unexpectedly, he mentions the ark of the covenant. In Hebrews 9 the author is contrasting the old covenant with the new covenant. Don’t make the mistake of thinking that the old covenant is law and the new is grace—for both law and grace are found in both covenants. You are on firmer ground when you contrast earthly with heavenly. The tabernacle was an earthly manifestation of the glory of God’s heavenly throne. It was a picture pointing forward, even as God’s people found grace and forgiveness as they worshiped there. Christ, the High Priest of the new covenant, has not served in an earthly tabernacle, but has gone through the heavens. He has not merely stopped at the front porch, or in the entry way, or the hall, but he has gone into the highest heavens, he stands before the very throne of God. Yours is a covenant of fulfillment, not just of promise. Interestingly, it was the old covenant that had the colorful robes of the high priest, the burning of incense, and the accompanying ceremonies. The new covenant ahs the reality itself, but a reality that has to be seen, this side of glory, with the eye of faith. To go back to outward ceremonies is not progress, but regression. Christ’s sacrifice has removed your sins once for all. In Hebrews 9:11-15, the author contrasts the ceremonies on the Day of Atonement with the perfect work of Christ, accomplished by shedding his own blood. The once-for-all character of Christ’s sacrifice is crucial, and it provides you with assurance, with confidence that you sins are forgiven as you trust in him. It has been 500 years since Luther nailed the 95 theses to the door, but the Reformation is crucially important. It draws your focus away from yourself to the Lord who has accomplished your salvation for you. Your consciences have been cleansed to serve the living God. Why did the Lord make the atonement cover his footstool? Not just so that his people could be saved from their sins and have life instead of death. Even more, he wanted his people to live and act as his holy people. Not only the cherubim, but his people were to join in sounding his praise. They were cleansed, so that their daily lives could be lived to his glory. Hebrews 9:14 tells you that what was pointed to in the tabernacle is even more true in what Christ has done. You have been cleasend by his blood. Your conscience has been renewed. Your daily life is to be lived in the presence of God and to his glory. That changes every detail of how you life. It sets a new direction for you. The ark was a magnificent gold covered box. You have had your sins cleansed at a far more spectacular sight—Christ has entered heaven itself and has covered your sins so that you can serve him.